After earning our reputation in quality Paintless Dent Repair services and auto reconditioning services, Dent Wizard has expanded our service offerings to become North America’s leading provider of SMART (Small to Medium Area Repair Techniques) repairs. 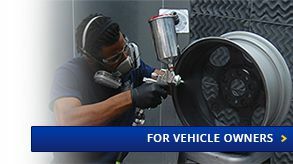 Dent Wizard’s SMART repair services now include several specialized wheel repair and custom wheel refinishing techniques for both vehicle owners and auto service providers (including dealerships, body shops, tire & wheel shops and more). We provide a variety of wheel remanufacturing services to fix wheel scrapes, gouges and cracks. We can also fix bent rims and provide other wheel straightening services. Additionally, Dent Wizard offers custom wheel refinishing, wheel painting and wheel powder coating. Dent Wizard’s New England Wheel Repair Center in Bloomfield, CT was featured on WFSB’s Better Connecticut to discuss our wheel remanufacturing processes. Discover how top-line equipment paired with trained specialists makes us the industry leader in wheel repair and wheel customization. The services highlighted in this video are available at all three of our Wheel Repair Center locations. Dent Wizard’s wheel repair services are a value-add for dealerships, body shops, tire and wheel shops and other auto service providers. We bridge the gap between this high need for alloy wheel repairs and the expertise, equipment and dedication to quality needed to carry them out. Make your car look like new or give your vehicle a new personality with our convenient and fast alloy wheel repair and color changing services. Learn more about our capabilities and schedule your wheel repair today. 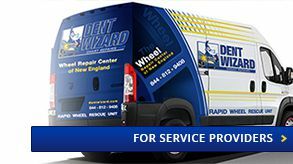 Dent Wizard wheel repairs are completed in our state-of-the art Wheel Repair Centers located in St. Louis, Missouri, Phoenix, Arizona, and Bloomfield, Connecticut. Learn more about each of our locations and schedule your wheel repair or custom wheel refinishing services today. Dent Wizard is a leading provider of SMART reconditioning services, including dent repair, wheel repair, bumper repairs and interiors. We've been dedicated to continuous innovation and excellence in the auto reconditioning industry for over three decades. Dent Wizard is hiring skilled technicians and experienced sales and operations managers. Get a fresh take on the automotive industry from Dent Wizard’s SMART Repair experts. Find useful consumer tips, and learn how Dent Wizard helps businesses grow!